The majority of companies have key people who are essential to the success of the business. Whether these people are valuable because of their expertise, power, innovation or information, if they are uninsured, their death or disability would bring financial insecurity to the company. Help your clients relieve the worry by protecting their financial security with Key Person Failure to Survive Insurance. Three partners whose firm would like to purchase $2,000,000 of key person life insurance on each of the very busy partners. Like many Key Partners, they shunned the extensive underwriting requirements and the required para-med exam. 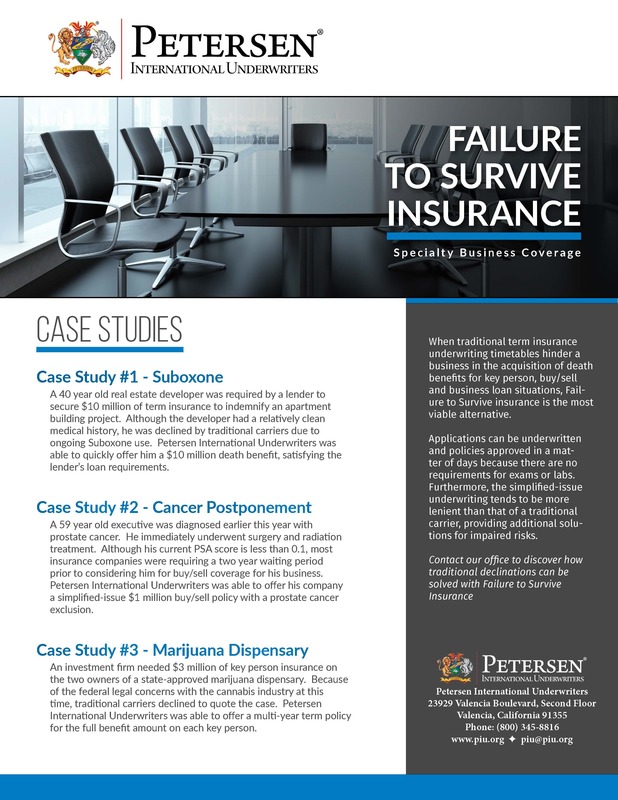 The producer called Petersen International Underwriters and was provided quotes on each partner for a $2,000,000 Key Person Failure to Survive Plan. Offered in a very timely manner and requiring only a one page application and financial justification, this plan was just the “key”. 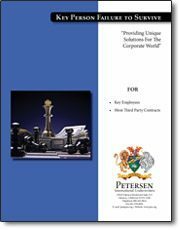 The Petersen International Underwriters Asset Protection plans can help producers solve problem cases thought to be undoable or even uninsurable. Informed producers now make Asset Protection part of their portfolios. Often times what stops firms from securing proper insurance coverage on their key people is the sometimes difficult and time consuming process of applying for coverage. Petersen International Underwriters developed this plan partly with this in mind. Additionally the plan design is excellent for those who are having trouble finding coverage from traditional insurance carriers. 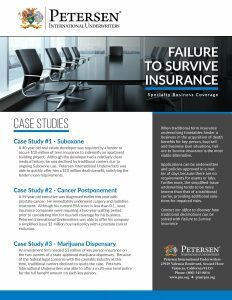 With no medical exam required, Petersen International Underwriters can issue the Key Person Asset Protection Insurance Plan normally within 24 hours of the application submission. Keep your clients financially secure with the Key Person Failure to Survive Plan.